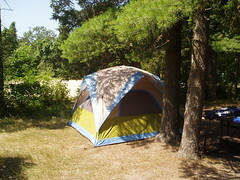 I've just returned from The Pinery Provincial Park where I've been recharging my batteries for the past three days. It was my third visit to Pinery, and my second in row. Last year around this time I was raving about Pinery's sandy beaches. We had a very full first day. We set up the tent, ate lunch, went swimming, went for a hike, went swimming again, played with arts and crafts, ate dinner, went on a big hike and hit the hay. It rained while we slept, which I actually prefer when camping. I find the rain hammering the tent drowns out all that rural silence. Then, we woke up, had breakfast, went for a hike, went for a swim, had lunch, went for a bigger hike, went to story time at the visitor centre to learn about frogs, went for a swim, had dinner, played, relaxed and got ready for bed. It was hot, the water was warm, the kids were great, the entire mini-vacay was perfect. I'll have more to share later, in the meantime, here's my Flickr photoset from our camping trip to Pinery. I guess the the gas $ you were the only people there.